It seemed high time to check in on Bayou Fountain, considering we haven’t been there in quite a while. 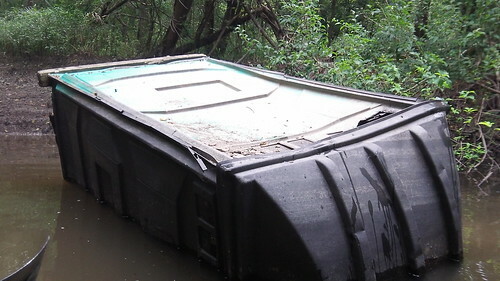 Also, there’s a portapotty somewhere out on the bayou, and it seems it’s about time to mount a recovery operation. For this run, Mike was out of town, but David decided to tag along. We brought the canoe and gear plus his kayak. We put in at the usual launch from the west side of Highland Road Community Park. (The gap in the trees is straight out through left field.) 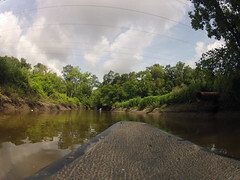 There was newish fill reinforcing the bank, which made it rather steeper than last we were there, but the log in the bayou still makes it the best launch available. We set off down the bayou at 8:15am. Fifteen minutes later, we arrived at the first major problem. 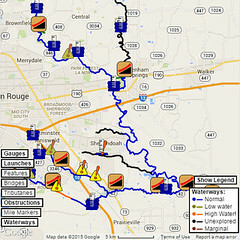 Halfway between PFF Blockage #3 and #4, there’s a new fallen tree that has completely blocked the bayou. It has a well developed litter/debris raft. The tackle was broken out, but the downed tree is dug in on both banks. It will only be a moderate problem to attack with full gear (saw it in two, then lay into the comealong), but it was beyond the scope of this recon, so the attempt to move it was scrubbed and we continued along. 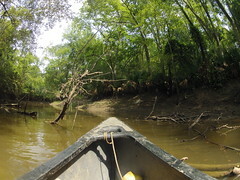 After getting out and putting the waders to good use pulling the canoe and kayak through the debris, we continued on. Everything was nominal (a few shallow logs, but nothing unexpected) until we arrived at PFF Blockage #9. 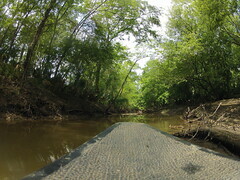 There is no channel at all remaining, and the logs blocking the left side (facing downstream) will require rather a good bit of putting in of backs. Needless to say, this was well outside the scope of work for the recon, so at around 10:30am, we turned back. On the way back, as we were passing a construction site, we watched as the backhoe/excavator dumped a big bucket of mud and water right down the bank of the bayou. We didn’t stick around long enough to get live video of dumping, but you can see from the photo that they’ve been dumping mud down the bank for a while. I may be mistaken, but construction sites are required to do various things to *minimize* the amount of material that ends up in waterways, eh? 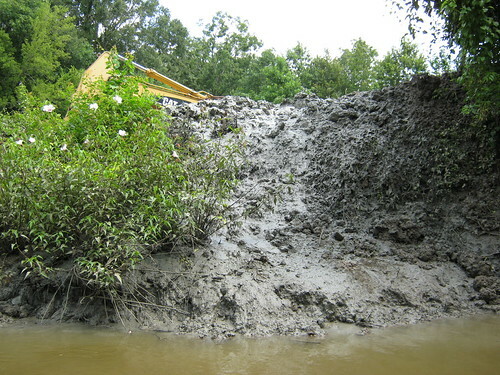 Intentionally dumping mud directly into the bayou seems rather far outside proper practices. We continued past the launch point all the way to Siegen Lane. From under the bridge, we looked upstream to see a large mud flat. There wasn’t any water channel at all to paddle through. It’ll be interesting to see what’s beyond that first mud flat, but a loaded canoe didn’t seem like the right vessel for that, so we headed back to the launch. By noon we were out of the bayou, total distance 4.1 miles round trip. Obstructions turned us back only a couple miles in, and knowing they’re there, one of the objectives was complete. 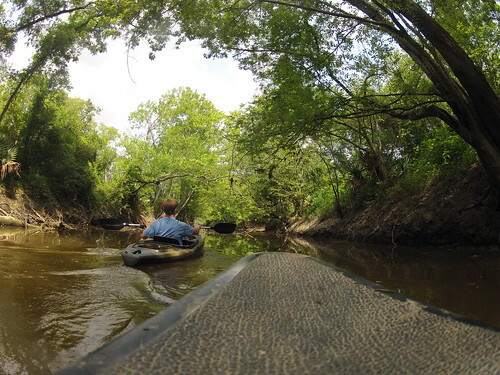 We know the bayou needs some major work again to make it portage-free. There was a second objective, however, that was not yet complete. We still wanted to get coordinates for the portapotty and conditions for the route out. A quick swap of the canoe and gear for a little kayak and it was time to attempt phase two of the day with only one of us. So, without further ado, we continue with Nathaniel’s report. I apparently don’t drive around there much, as I had not been informed of the road closure. It’d be a long drive to approach from the other side, so I decided to scrub the Alligator Bayou entry. I drove back to Airline Highway at the State Fairgrounds, thinking that there *might* be a way to the water under or beside the bridge. Let me assure you that there is no such thing. There’s a veritable jungle in the way, so that was right out. That left the Manchac Park entry, which I’d scouted before and knew was usable, so there I went. It’s just slightly less than three miles from the Manchac Park launch to Bayou Fountain, so an hour later, I was on Fountain. I did verify, however, that there were several downed trees across Bayou Manchac. While it’s possible to slide/shove your way over them in a canoe or kayak, at least a couple don’t have wide enough openings to pull a canoemaran (two canoes strapped together) through. 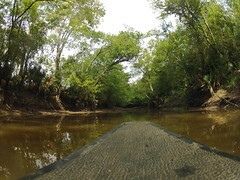 There were also a few small jams of several long logs each to fight through on Bayou Fountain, but they were simple logjams without large quantities of flotsam. Just under a mile up Bayou Fountain, I found what I was looking for. It’s starting to collapse now, and considering the lack of adequate space to pass a canoemaran, carrying it out intact looks like it may not be possible. I think we’re probably going to have to chop it up to get it out, but it’s still going to be fun. The bank actually has a fairly shallow slope, so it should be easy enough to drag it onto “dry” land to take it apart (with saws, hammers, snips, or whatever — we’ll have to shoot video). The total round-trip from/to Manchac Park added up to 7.7 miles, so not a bad trip at all. The moderate obstructions are going to take some effort to move across, but nothing that can’t be handled. Breaking it down and taking it out in pieces will make it vastly easier to get ashore at the park for disposal, so that seems like the right plan.